This was a supported trip planned and organized by Paddle Florida, Inc., a non-profit whose purpose is to help people experience and preserve the real Florida. 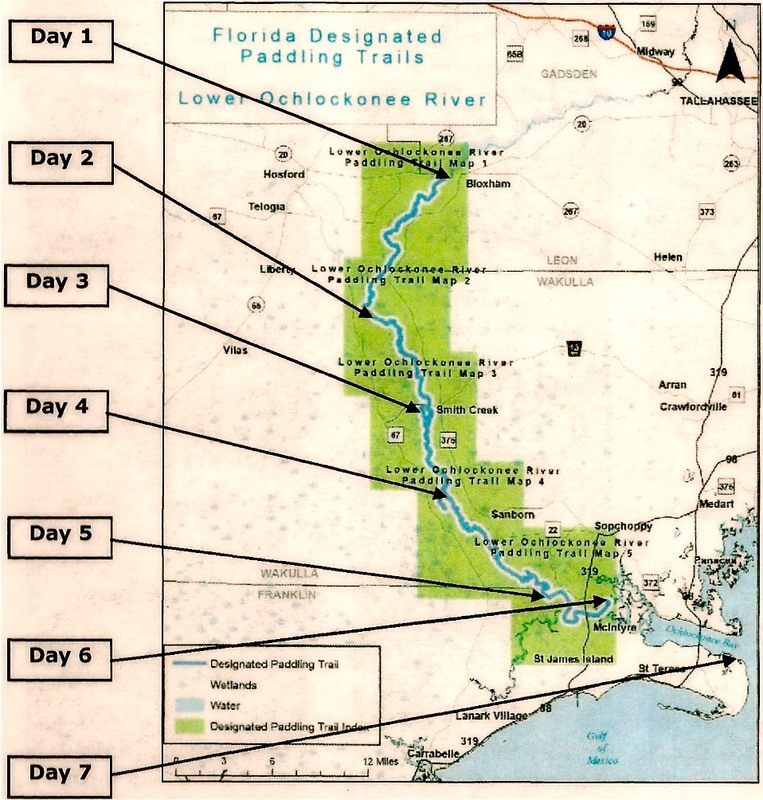 It utilized the Lower Ochlockonee River Paddling Trail, extending some 76 miles from the Telquin Dam to Bald Point State Park in Ochlockonee Bay. 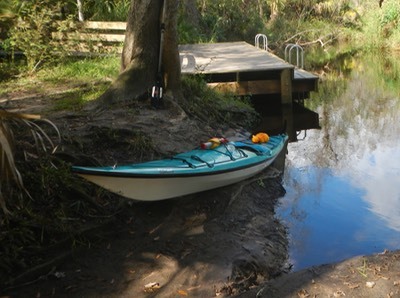 Here is a link to information on the Lower Ochlockonee River Paddling Trail. This is not a difficult trail and could be done by a small group of unsupported paddlers. 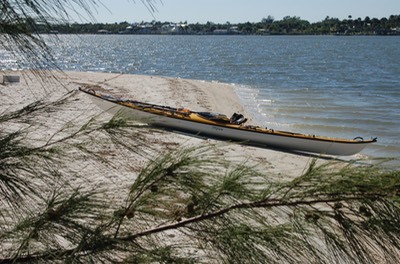 For additional information on this and other Florida paddling trails, visit the Florida Paddling Trails Association. The best way to view the videos on this page is to click on the "full screen" box at the bottom right corner of the video frame. You will see much more detail by doing this. Press the escape button (esc) on your keyboard at any time to go back to your original screen. Our route from the Talquin Dam, 73 miles to Bald Point State Park. The pattern of days and weather was eerily similar to last year. Sunday night we got five inches of rain. It rained hard all night. We were all pretty wet. The river rose two feet overnight and the current really started to move. Monday night we got another inch of rain. Our campsite became an island as the river overflowed its banks and surrounded our little campsite. Finally, on Tuesday we got some afternoon sunshine and began to dry out. It has been sunny but cool since. Even with the rain and gray skies, this has been a good trip. Tomorrow we tackle Ochlockonee Bay again. I pray for milder winds than last time. What follows is my report on what happened on this trip as it happened, along with photos and video reports. Enjoy! I’m sitting in my camp chair next to my tent at Ed and Bernice’s Fish Camp, our launch point. iI’s almost 5 PM. I’ve been up for 13 hours. I’m tired. Florida's a big state. It was 358 miles to Bald Point State Park. The alarm sounded at 4:15 AM. I dragged out of bed in the dark, grabbed my clothes and headed for the kitchen, closing the bedroom door quietly behind me. My route today would take me on a diagonal path north and west through the center of the state, from Sebastian on the southeast coast to Panacea in the Panhandle, West of Tallahassee. I got something to eat, packed the car, kissed Lisa goodbye and headed out by 5:30. I drove in the dark for several hours. It was almost 8 o’clock before the sun came up. Stops for coffee, gas and bathroom breaks added almost an hour to my trip. I arrived at Bald Point State Park about 11:45 AM where I would leave my car and catch a shuttle to the Fish Camp. That damn rooster! The Song line says, “...when the rooster crows at the break of dawn...” Well this guy didn’t get the memo! He started crowing at 2 AM. Dawn didn’t arrive till about 7:30. And he was still crowing when we left at 9 AM! I was up before 6 o’clock. That was two hours before breakfast and three hours before launch, too early to start packing. So I read for a while then packed up. The weather forecast was bad. There was a 90% chance of rain with 18 to 25 mile-per-hour winds from the Southwest. Thunder storms and heavy rain were probable after 2 PM. We had 15 miles to paddle on this, our first day on the river. Folks were anxious to get on the water. The first boats left at 8:50 AM, mine among them. The sky was overcast with heavy gray clouds. The river however was wild and beautiful. Dark skies somehow added to the stark beauty and wildness of the place. It is spring here in Northwest Florida. 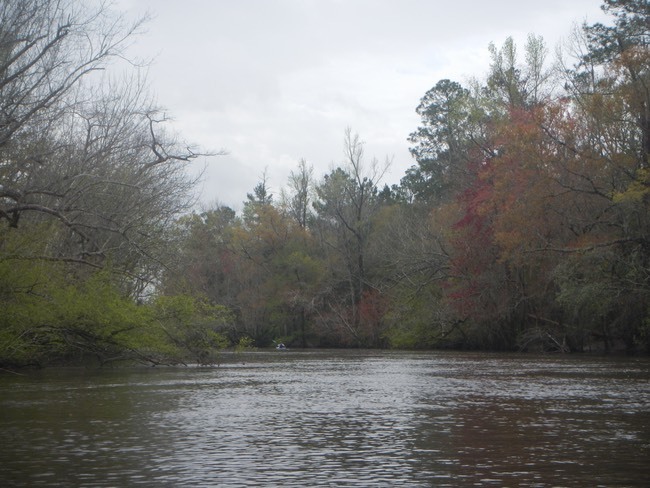 Unlike much of the southern part of our peninsula that is subtropical and green all year, this northern area’s trees lose their leaves, so as I paddled, I saw the Bald Cypress, Tupelo, Maple and Willows beginning to leaf out in a variety of green, orange, red and yellow colors. Our lunch stop came at 7.5 miles into the trip. I made it in under two hours. Back on the water, the wind picked up. It was right on our nose most of the time, with occasional gusts that would stop my forward progress dead in the water. 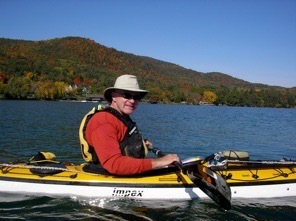 There was an occasional sprinkle that, with the chill of the wind, had me grateful that I had worn my paddling jacket. I wanted to get to the campsite before the rain, so I went on a four mile sprint to catch the lead boats. It’s now 2:20 PM. I’m sitting by my tent drinking a cup of coffee and listening to the thunder in the distance. The storm may hit us or go by us. I’m ready for it in any case. 8:24 PM: It’s been raining hard for over five hours. We ate dinner in the rain. Many tents have been flooded out with contents, especially bedding getting wet, If tents are not placed carefully or not set up properly they are vulnerable to flooding. Any tent will leak to some degree after hours of steady rain. Along with the rain we’ve had periods of thunder and lightning, some close by. Staying safe and dry definitely poses a challenge. I seem to be in pretty good shape. The inside of my tent is damp in places and a few drips have come through, but overall things are good. I picked a high flat spot for my tent that showed no signs of water having washed through from previous storms. I use two ground cloths, one outside under my tent and another inside. Any water that gets between the outside ground cloth and my tent's bottom is kept away from my gear by the inside cloth. It works well. All my clothing and gear are in the two waterproof duffels I use on these trips, so it stays dry. The most vulnerable item is my sleeping bag. A few smart people kept their sleeping gear packed in dry bags. Not thinking about this kind of rain, I set up my bag for sleep. It has gotten a little damp but not wet. My Big Agnes sleep system slips a sleeping pad into a sleeve on the back of the bag, essentially keeping it four inches off the floor. When I started to get some drips on it, I folded it in thirds and covered it with a small tarp I carry. I will probably sleep with this tarp over me tonight. Other than that I’m doing okay. I’m hoping that the rain stops before I need to pack up in the morning. One ominous sign for tomorrow’s 16 mile paddle is that the river is already up 12 inches since the rain started ,with the current moving fast. Doug Alderson, author and environmentalist. In addition to being our lead paddler for the first two days, Doug Alderson presented again this year. His topic was various adventures he had growing up and later. These were stories from a new book about to be published. 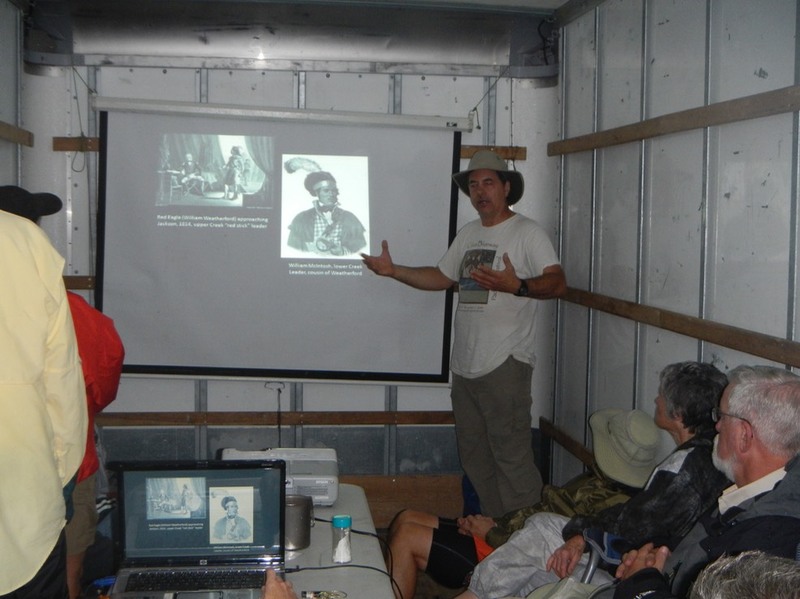 Once again he had to present in the large Penske truck because of the steady downpour. It was "deja vu all over again". Those readers who were on this trip in 2013 will recognize that this photo is from that year. Click here for Doug's Home Page. It rained hard all night . 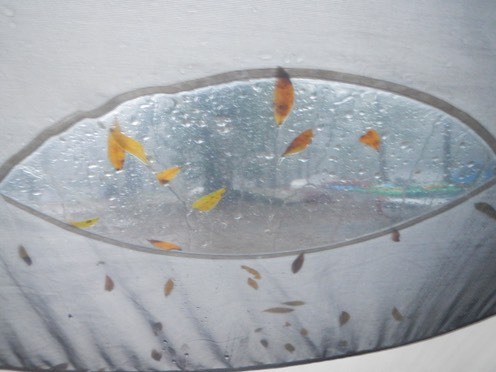 The rain made quite a racket on the rainfly of my tent. I was awake at two o’clock and again at four. I thought about getting up at five o’clock, but for what? It was still raining hard and it was three hours till breakfast and four hours till launch time. So I rolled over and fell asleep again. I awoke with a start at 7 AM. The rain had slowed to a light drizzle. I hurried to pack my inside gear. Everything that wasn’t wet was damp. I hate packing up wet gear, but I had no choice. The outside of my tent was wet, and muddy around the edges. I rolled it up and stowed it in my boat. Then went to breakfast. Doobie outdid himself this morning. Nothing was homemade as far as I could tell. The pancakes were so regular in shape they might have been frozen. The hashbrowns looked like they came straight from McDonald’s. And the meat ? It was some version of Spam! I haven’t had Spam years. It was the “lite” variety and it tasted real good (sorry Dr. Oz). I made a sandwich of two pancakes with spam in between. Delicious! We launched just before 9 AM. I was with Doug Alderson, the lead paddler. The river had risen two feet overnight and was moving very rapidly. The scene was again wild and beautiful. The sky was dark and overcast. However, overcast skies give a life to the colors of the trees and flowers that bright sunshine masks. The greens and reds and whites of the new leaves and flowers so recently emerged from their short winter's nap stood out in sharp contrast against the dark of the overcast sky. This stretch of river had many narrow twists and turns. The swiftness of the current eased as we paddled further downstream. With the river at flood stage, it’s waters spread far into the forest on either side, slowing the current by absorbing some of it’s rush and power. There was no wind to speak of. The river was glassy, flat and silent except where a snag caught the fast moving water that forced its way through in a noisy rush. An occasional light rain fell, mostly unnoticed by us. We reached our campsite at White Lake around 12:30 PM; the distance, just under 16 miles. As I sit in my tent writing this, another rainstorm has moved in. it seems gentler than last night’s storm but may last all night again. Still, it will have to get a lot worse to equal last night’s downpour, and I survived that okay. I guess I will be alright again tonight as well. Kelly Langston comes from generations of bee keepers. Although she is passionate about bee keeping, she is not a bee keeper. She is very allergic to bee stings! 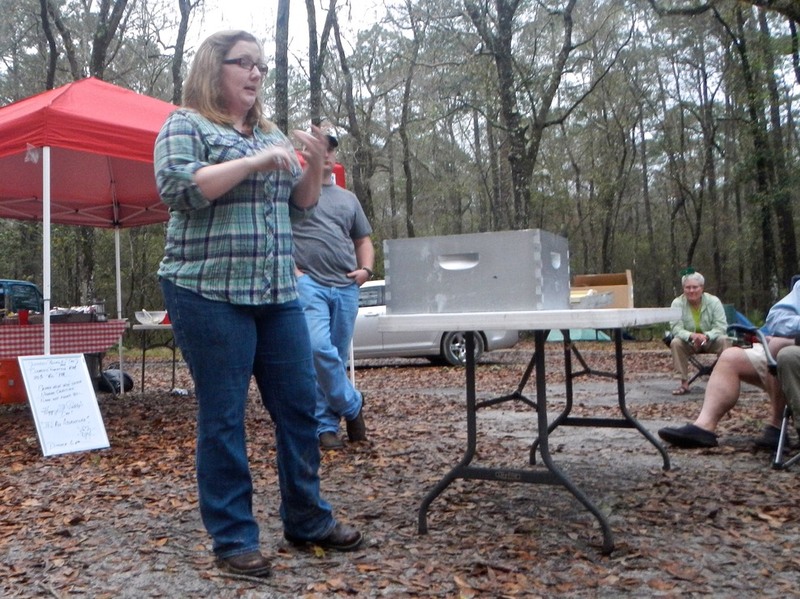 So she works for the Florida Fish and Wildlife Conservation Commission, and promotes bee keeping whenever she can. When told of this presentation, my first thought was "Boring!" This was far from accurate. Kelly made an interesting, lively and educational presentation. Conditions: Cool and overcast. Intermittent rain. River at flood stage. Strong currents. Sunshine! Even through the scattered clouds, a bright blue sky and warm sunshine come through. I’m sitting by my tent soaking up the warmth in the late afternoon sun. 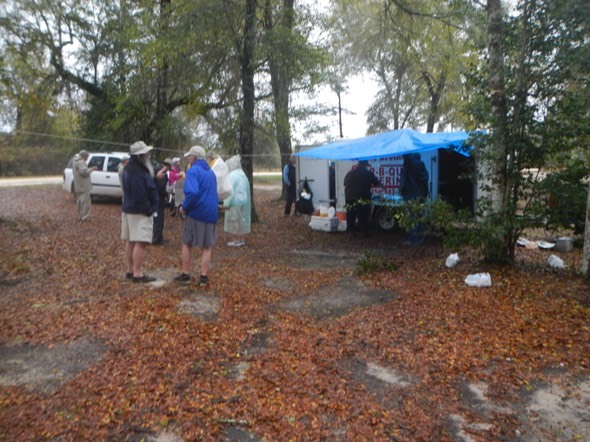 I arrived at our campground in the Apalachicola National Forest's Mack Landing campsite around noon, giving plenty of time to dry all of my wet gear from the past two days of rain. We had six inches of rain in all, five inches Sunday night (a record for the date) and another inch last night. Everything was either wet or damp. Now all is dry. I'm sitting here enjoying the filtered sunshine. Life is good! Today’s Paddle was challenging and at times difficult. The river itself continued to impress. But it was hard to know where the river was. It was at flood stage and this is a wild river, cutting new routes and abandoning old. My GPS showed that we paddled over “dry land” several times. The river stretched into the forest as far as the eye could see in both directions. Between tree falls and snags that blocked our path and the rush of strong currents, we sometimes strayed from the river’s course, but always found our way back. We got in fairly early but some folks arrived much later. There was at least one capsize and as I write this, two paddlers have yet to arrive. Thankfully, there is no rain predicted for tonight. That’s the good news. The bad news? We expect it to be cold tonight – 47°. 5:10 PM: We still have two paddlers out on the water. One of them is close to his 80th birthday. We are concerned . It will be dark in two hours. A search party has been organized and is out looking for them. 6:45 PM: Our wayward peddlers have been found! They paddled back upstream to our lunch stop. Having been completely lost, they wanted to go to a place that they were familiar with. They knew there was a road there where they might get help. A local person happen to stop by the lunch stop. He picked them up and gave them a ride to our campsite at Mack Landing. We were really pleased that there was nothing more serious then the fact that they were lost. Each night of our Paddle Florida Trip on the Ochlockonee River featured some sort of entertainment. This night it was the Sarah Mack Band. Sarah did a great job of performing in what was probably the strangest venue she'd ever been in; under a tarp at the Mack Landing Campsite in the Apalalachicola National Forest. Here is an excerpt. Conditions: Cool with filtered sunshine. Tree falls and snags. River at flood stage. Strong currents. 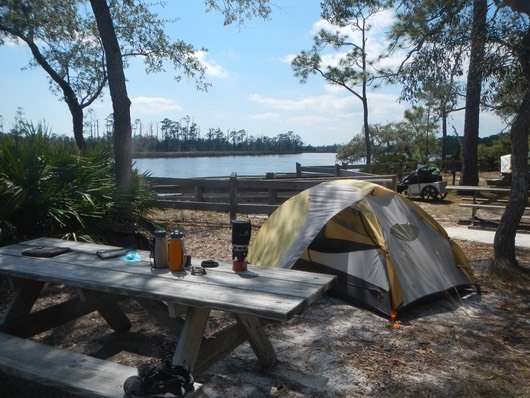 At Womack Creek Campsite, Apalatchicola National Forest: How do you sum up a beautiful day on the river? We left the Woods Lake Campground in the Apalachicola National Forest at 8:50 AM. The river was flowing fast. I was with the lead group helping Jill navigate and keeping a pace that would make Catherine comfortable. The river was wide, wider than normal, with water spilling into the forest on either side. There was little evidence of human habitation here save for a few randomly scattered fishing camps, that sat moldering in the grayness of the flooded forest at the rivers edge, with no sign of life. The river moved us quickly. Our average speed was 4.6 mph at leisurely paddling pace. We reached our “lunch” stop at 9 miles into the trip in about two hours and camp in another hour beyond that. The paddling was easy and pleasant, but you needed to pay attention to the speed of water and quickly shifting currents and eddy’s. The campground here at Womack Creek is lovely. It sits on a high bluff at a bend in the river. The grounds are flat and open with widely spaced campsites. After spending the past several nights packed it into small spaces with several other campers, I selected a site that was a little more isolated, one that would not accommodate another tent. The luxury of a warm shower and shave awaited me. I had had neither since I left home last Saturday morning. 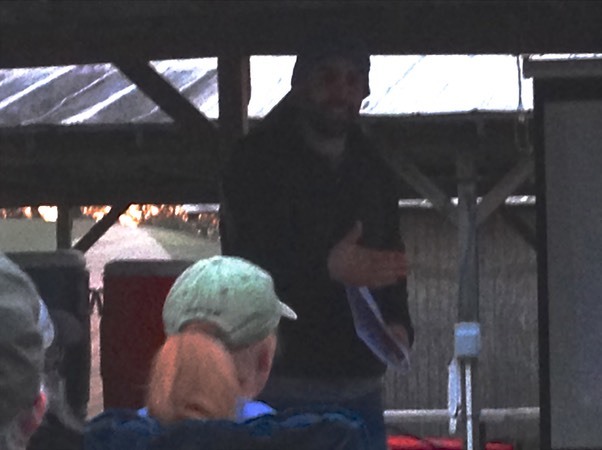 We had our dinner and a short presentation by the Apalachicola River Keeper. Now I’m in my little cocoon, my two-person REI Half Dome tent, preparing for what may be a cold night. Tonight's educational presentation was by Don Tonsmeire, Apalachicola Riverkeeper. I was impressed with the progress he has made in coordinating efforts with Georgia and Alabama around water use and conservation issues as they impact the Apalachicola River ion Florida. In addition, his Board President, Tom Herzog described his work in establishing a new exciting seventy mile watertrail around St. John Island. My Max Speed: 10.6 mph! Conditions: Cool and overcast. Tree falls and snags. Light breeze. River at flood stage. Strong currents. 2:34 PM at Ochlockonee River State Park: I’m sitting here in my camp chair looking out over the serene vista of the Ochlockonee River, telling myself I should take a walk along several of the trails in this lovely park. But my body just won’t do it. I’m tired. And tomorrow could be our most difficult day. This section of the Ochlockonee River, from Womack Campground to Ochlockonee River State Park, was the least interesting part of the river so far. It is wide and straight, and the similarity of it’s features renders it essentially, featureless. Because today’s Paddle was so short – 7 miles door-to-door, I decided to paddle down the Crooked River. I had enjoyed paddling this river last year and wanted to do it again. I paddled downstream past a large island, then turned around and came back, covering almost six miles. The Ochlockonee and the Crooked Rivers flow south into the Gulf of Mexico, the Ochlockonee in the east and the Crooked in the west. The two rivers and the Gulf create a large island called St. John. A new water trail is being created that will start at Bald Point State Park, travel up the Ochlockonee to the Crooked River, down the Crooked River to the Gulf, and East along the Gulf shore, arriving back at Bald Point. The distance is 70 miles and will make a fantastic 5 to 7 day trip. We haven’t seen much wildlife on this trip. Wading birds can’t wade in this high water. I did see a small alligator today and some banded kingfishers. You can often hear the ubiquitous woodpeckers echoing through the woods, and the haunting hoot of owls off in the distance. But the flooding has driven most birds and animals into the woods. Since I’m not taking a walk, I’ll probably go get a shower and take a nap. Or maybe a nap then a shower. These decisions are so hard! Then I’ll probably read for a while before dinner. Daryl Doobie and Yackman in front, Steve, A.K.A. "Sugar" and Buddy in back. I’m sure dinner will be another Daryl Doobie gourmet delight. Doobie’s food is hardy and basic, and not something Dr. Oz would approve. 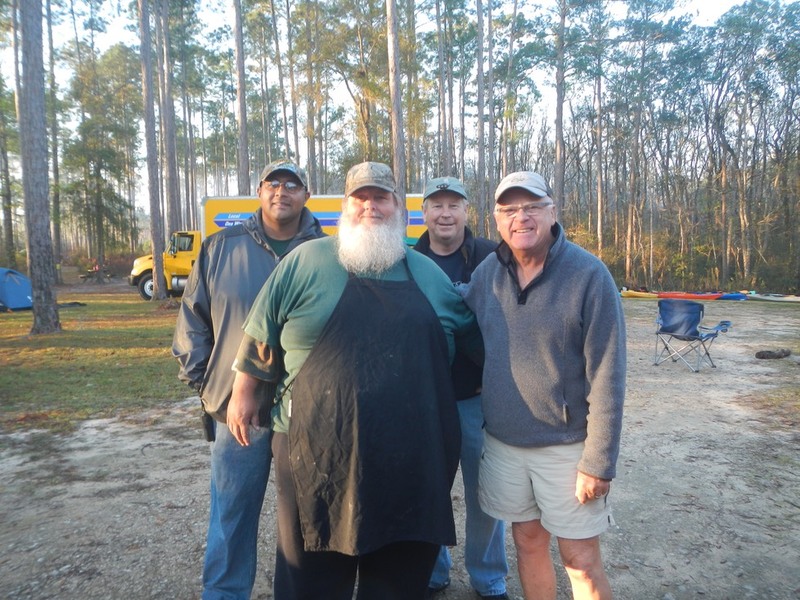 At about 300 pounds, with a full beard, and no teeth that I can see, Doobie makes quite an appearance (does Duck Dynasty come to mind?) But despite my stereotype, Doobie and his crew, Steve and Buddy, are the nicest, kindest people you’d ever want to meet. 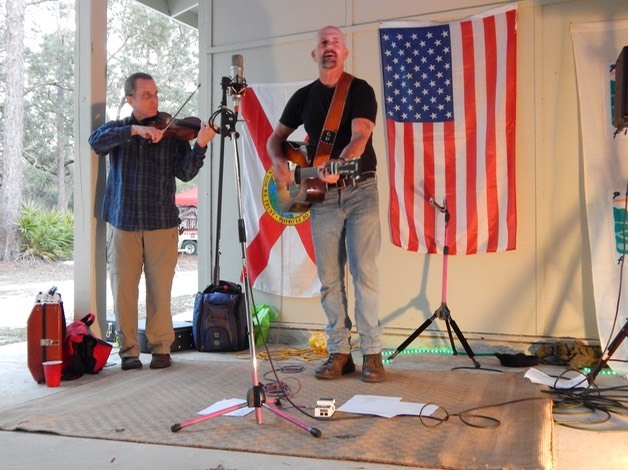 Grant Peeples performs tonight. He’s one of my favorites. Then it’s on to Bald Point State Park in the morning and home tomorrow night. Our entertainment this night it was Grant Peeples, one of my favorites. Grant did a great job covering some his old favorites and adding some new songs as well. This excerpt is one of his new songs. Conditions: Cool and partly cloudy. Light breeze. River at flood stage. Ochlockonee current-2.6mph. Crooked River Current negligible. 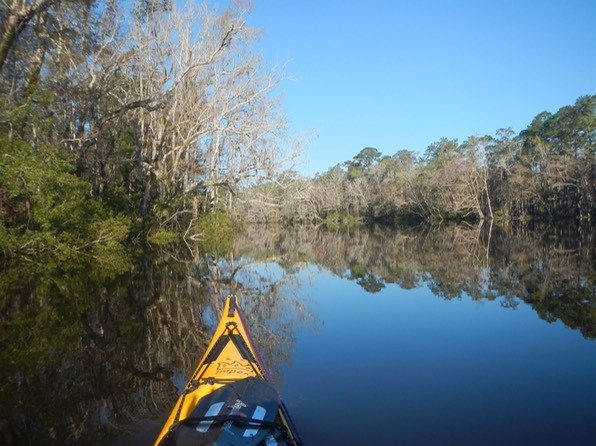 Miles Paddled: 7.0 miles on the Ochlockonee, 5.7 miles on the Crooked. 8:35 AM: We launched in flat calm weather and bright sunshine. Many people elected to go without paddling jackets. But I decided that typical whether on the bay would be windy and wet, so I wore my jacket. I paddled quickly, averaging 5.0 mph on the 4.7 miles to Ochlockonee Bay. The river was quite wide here. Forests gave way to open grasslands. The bright morning sun was rising just off my port bow. It was blinding, even with sunglasses. The wind picked up, as I knew it would, as we approach open water of the bay. Like last year, the wind was out of the southeast, blowing the whole length of the bay. This long fetch allowed waves to build up, and because the water was relatively shallow, the period, or distance between crests, was quite short. This made for wet, hard paddling, slowing my speed to about 3.5 mph. When I finally made it to the bridge I stopped to stretch and celebrate, because I hadn’t made it that far last year. The wind in the outer bay seemed less strong and the waves much smaller. We speculated that the many oyster bars in the outer bay prevented the buildup of larger waves. Soon I was at the beach at Bald Point State Park along with a few other early arrivals. It was about 11:30 AM. After loading my boat and gear and saying goodbyes all around, I headed home only to find that my GPS was malfunctioning. Does anyone actually carry a paper map any more? Well I should have! So I limped home using the paper print out from Google I carried as backup. Conditions: Flat calm on the river, winds building on the approach to the bay. Winds SE in our face at 12-15 mph. Seas 1-2 feet on inner bay, less wind and waves after the bridge. Many oyster beds to dodge.